American Orthodox Church, a list of Icon webpages. The gallery offers many different types of icons, including authentic antique icons, beautiful newly painted icons, brass icons and a unique series of mounted icons, consisting of high quality giclee prints mounted to traditional solid wood panels that capture much of the “look and feel” of traditional painted icons. Ateliíer St André. Byzantine Icons. A web site created by a community of contemporary iconographers working in traditional Byzantine style, to explain the techniques of both icon painting and fresco, to define the principal components of Byzantine aesthetics, and to present examples of the work from the workshop. Atelier St André. Aidan Hart (Shropshire, U.K.), painter and carver of sacred icons. Aidan produces holy icons, carvings and metalwork on a commission or freelance project basis. See contact details for commissioning a work. Borobodur, Sanchi, Stupas, Hand Mudras, Mandalas, Tibetan Art, Tangkas. The John C. and Susan L. Huntington Photographic Archive of Buddhist and Asian Art represents over thirty-five years of field documentation photography. A Journal exploring art and Buddhism. Online exhibitions of over 1000 ancient icons. Andreas Menelaou one of the top Canadian-Cipriot Byzantine Greek Orthodox master iconography mural artists working today. Over the years he has hand-painted portable icons for private devotion as well as large wall murals for individuals or Greek Orthodox Churches across Canada, USA, Greece and Cyprus. Handcrafted orthodox icons of Christ, Theotokos, Saints, Feasts and travel icons. All christian icons are painted with egg tempera on wooden panels or canvas, 23 karat gold and special technique of gold-carving. Icons (or ikons) gallery from the Church of Greece. The Treasures of Mount Athos. Hellenic Ministry of Culture. An online exhibition: incunabula, Slavonic manuscripts, Greek manuscripts, Georgian manuscripts, music manuscripts, carving, ceramics. Saint Catherine’s Monastery, Mount Sinai, Egypt. a free-content encyclopedia and information center for Orthodox Christianity that anyone can edit. Traditional Byzantine iconography by Paul Azkoul, a member of the Orthodox Church. Wikipedia entry on the Icon. The on-line gallery of Russian icon master Vladimir Blagonadezhdin. Moscow, Russia; a selection of icons from their permanent collection. Iconography and religious art, a collection of pictures at Pinterest. The history and development of iconography, details of the craft, examples of icons and other works by Bob Atchison. Icons written by iconographer Xenia Pokrovsky, reviver of iconography in the USSR. Image explores the relationship between Judeo-Christian faith and art through contemporary fiction, poetry, painting, sculpture, architecture, film, music, and dance. The Orthodox Arts Journal publishes articles and news for the promotion of traditional Orthodox liturgical arts. The journal covers visual arts, music, liturgical ceremony and texts, and relevant art history and theory. A blog by iconography student Veronica (Ronnie) Cruwys, Staffordshire, U.K.
A thematic research collection contributing to art data analysis and the quantitative approach in art history. A blog on icons, by Mary Jane Miller. Manuscripts; illuminated manuscripts and Bibles. Heavenly Art.net. Byzantine icons by Vivian Karayiannis. A virtual gallery with abstracts, watercolors, Byzantine icons, Mediterranean oil landscapes, angels, frescoes as well as lots of links. The artist offers workshops and painting lessons. Theophania is a crafting studio that specializes in creating exquisite handmade Orthodox Christian themed crafts. They work with highly skilled artisans with years of experience in iconography, wood carving, mosaic and prayer rope tying. The Treasures of Mount Athos. Hellenic Ministry of Culture. An online exhibition: incunabula, Slavonic manuscripts, Greek manuscripts, Georgian manscripts, music manuscripts, carving, ceramics. Orthodox Byzantine Iconography, Ikon gallery. Ikon techniques, visual theology, iconographers’ prayers. Resources for Orthodox Christians and those interested in Orthodoxy. Religion and the Arts, a journal from Boston College. A Journal which promotes the development of discourses for exploring the religious dimensions of the verbal, visual and performing arts. British Museum catalogue of Russian Orthodox icons. Rublev, Andrei. Andrei Rublev, an early Russian Orthodox painter of icons. Andrei Rublev Museum, Moscow, Russia. 5 images. Russian traditional icons. Moscow icon painting school. Gallery of icons, easter eggs. Russian icons, an extensive website directory. Russian icons. 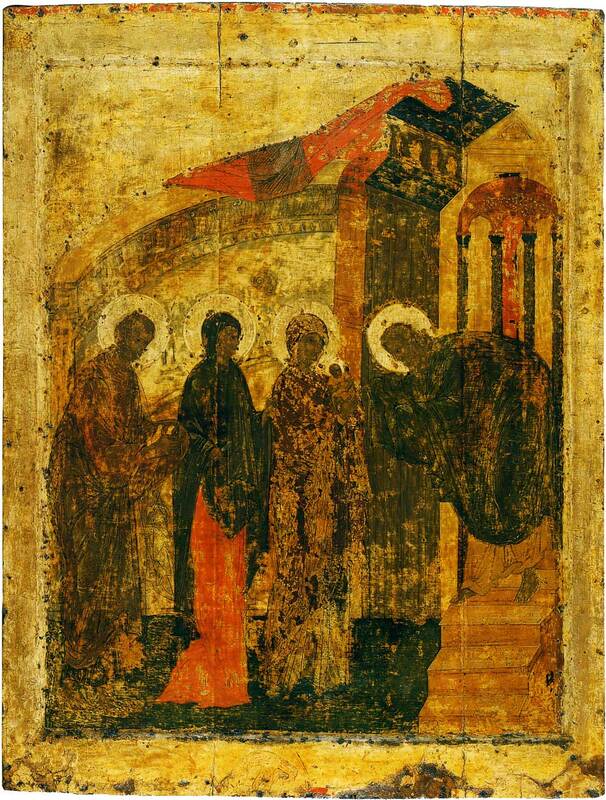 XI – XII Century Icon Painting, Pre-Mongol Period, Kiev – Vladimir – Novgorod. Olga’s Gallery. The Museum of Russian Icons was founded as a non-profit educational museum by Gordon Lankton. The collection includes about 370 Russian icons, the largest collection of its kind in North America. The Temple Gallery, London. A specialist in Russian Orthodox icons. Theophanes the Greek. Image gallery. Olga’s Gallery. Wikimedia online gallery of Russian icon painters. Wikipedia entry on ancient icons. Sacred Symbols and Places. World Mysteries.com. Symbols, an online encyclopedia of Western signs and ideograms. The Da Vinci Code, Wikipedia entry with essays and critical analysis. Orthodox Church Saints, Russian Orthodox Saints. Icon Painting Schools, a directory from Orthodox Christianity. Aidan Hart runs several workshops on painting icons. St Alexander of Svir by Unknown.